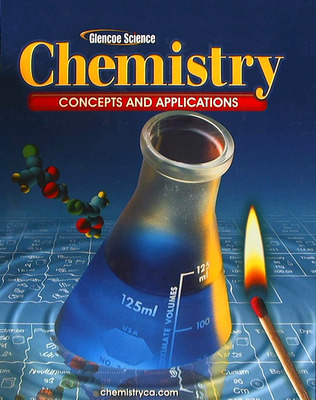 Chemistry: Concepts and Applications is a conceptual approach to the presentation of chemistry. It has a clear and comprehensive narrative of chemistry concepts with just the right amount of math. Two of many in-text lab options include Launch Labs and Try at Home Labs, the latter of which are unique to Glencoe. The program's media/technology support diverse classroom instruction. Provide clear chemistry application of key concepts with inquiry-based Launch Labs, safe and “doable” MiniLabs, and classroom-proven ChemLabs. Additional resource options are available for forensics, small-scale and probeware labs. Engage your students with exciting, colorful introductions to the chapter content, including a Launch Lab, previews like What I Already Know and Reading Chemistry, and a link to Chemistry Online. Help students prepare for local, state, and national tests with Standardized Test Practice and Test-Taking Tips in the chapter assessment. Offer a variety of review and practice opportunities with Example Problems, Practice Problems, and Supplemental Practice Problems. Provide your students with the side-by-side English/Spanish Glossary (Glossary/Glosario)—a unique learning tool for ELL students.